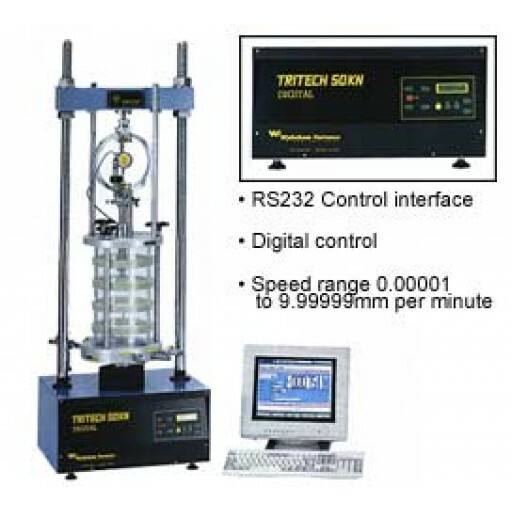 The Tritech 50 isdesigned to be used as part of a computer-controlled triaxial system or as a stand-alone unit. The RS232 interface enables it to be used with any computer. Combined with a logger the system can control the direction of travel, speed, rapid approach and unloading. The use of transducers will give automatic data acquisition and feedback to ensure accurate control of loading and strain in the sample. Simple control buttons on the front panel provide fast/slow, up/down and stop commands for platen movement. A waterproof membrane seals the panel and digital diplay from water and dust. The load frame is of rigid chromed steel twin column construction, for rigidity at high loads. Stabilising bars are supplies as standard, to screw into the top of triaxal cells of 70mm diameter or larger, for added stability. All external parts are either stove enamel painted or chrome plated for corrosion protection. The loading paten is made from stainless steel.